Here in beautiful Naples, Florida, you have a lot of options for where to get your nails done. However, we’re sure you know that not all nail salons are created equal! In today’s blog, Herbal Nail Bar is going to discuss four questions you should ask before choosing a nail salon to ensure you are getting a safe experience and long-lasting nails. Keep reading to learn how our Naples nail salon stack up to the competition! Is The Salon Clean, And What Are Their Hygiene Policies? Cleanliness of a nail salon is by far the most important feature. Even if they couldn’t paint a nail to save their lives, at least you know you won’t leave with a foot fungus or disease. Herbal Nail Bar takes sterilization very seriously. Disposable tools like nail files, pumice stones, toe separators, wood tools, and nail buffers cannot truly be sterilized in a way that would protect you and the product, so we dispose of these after each client. If you go to a nail salon that does not do this, be aware that this salon is cutting corners and violating health and safety codes. For metal tools, which can be sterilized, we use a hospital-grade autoclave — meaning doctors use the same type of system to sterilize surgical tools. It is the only way to properly kill spores and diseases that can otherwise be transferred from client to client. Nail salons that have metal tools sitting in a pool of blue liquid are not taking the necessary steps to protect you. Autoclaves are not required by the state, and a salon that invests in an autoclave invests in you, the client, as well. If you do go into a nail salon and are unsure about their hygiene practices, don’t be afraid to ask. The very best nail salons will be happy to show you their sterilization process. If your salon is charging $40 for a manicure and using a $2 nail polish, you can’t expect your manicure to last very long. At Herbal Nail Bar, we use the best polish brands like OPI, Dr. REMEDY® , and Zoya that you know will last. In addition to regular nail lacquers, we offer a range of dip powder manicure products, including Powder Perfection and SNS dip powder. We also offer CND Shellac nails, which last for over two weeks without chipping or peeling. As an organic nail bar, we offer a wide variety of herbal blend options to enhance your mani or pedi. These include an organic herbal exfoliation and soak with Dead Sea salt, an aromatherapy foot or hand massage, and more! We mix our blends in-house and incorporate fresh herbs and flowers into your service. What If You Don’t Like Your Nails? Our services are guaranteed, and we take pride in hiring only the best nail technicians. However, if for some reason you are unhappy with your service or the end-result, we will re-perform the service within five days. Do They Take Walk-Ins And Appointments? Some salons will only take walk-ins or appointments, but not both. This puts you in a tough spot when you try to head in for a quick mani/pedi on your lunch break and there’s a bridal party taking up all the seats. It also makes it difficult for those last-minute nail emergencies when you need a place that takes walk-ins. Of course, we will always honor our appointments, but we can usually accommodate walk-ins. If you are in a hurry, give us a call before you head over and we’ll let you know how busy we are. 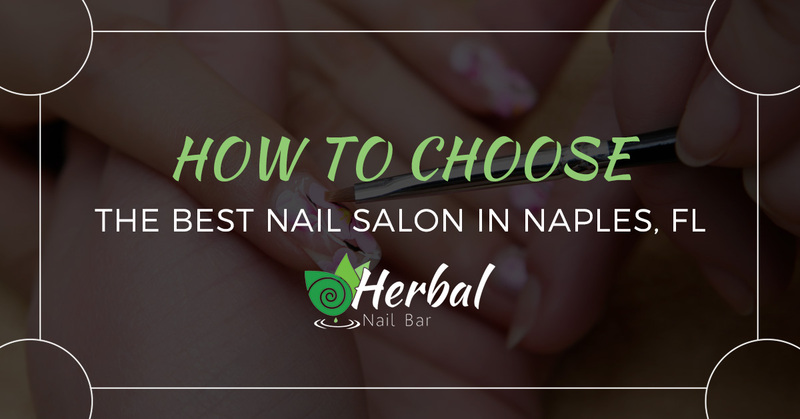 When choosing a nail salon in Naples, be sure to ask yourself the questions above. We would love to invite you into Herbal Nail Bar so you can discover the difference that a quality nail salon makes. Schedule an appointment today!